So, the first best part of quilt making is the reflection - the looking back on your work and taking it all in. Not only did this lead me discover an error yesterday, it has caused me to believe that my work is not yet done! So my wall hanging has evolved into something slightly larger (3'x5'ish) that will go on display above Lenora's desk along with the other flags she and her colleagues display in their office. I'm very excited! Now that I’ve made it a bit longer and allowed the colors to fade into other colors at the ends I am satisfied with the top. Here I have it pinned and will have it done in no time! I said yesterday that for me there is no one single thing that I consider the best part of making a quilt. But, after the little bit of time I spend oggling my new creation, the usual NEXT best part is turning these creations over to the person that requested them. This is special, no matter what. But some of the best feelings I get are when I’m delivering someone’s memories. Tshirt quilts are always a BLAST! And then there are memorial quilts that are a little more somber and heartfelt, evoking instantly a wave of emotions for the person who is receiving all of their loved one’s materials, now in a blanket that they can touch and feel and take warmth from. Boy, those can be emotional moments, but it is probably the proudest I ever feel about what I do. In the next week or so I want to take some time to go back through 2011 and catch everyone up on what’s been going on prior to blog post, day 1. We’ll talk about some memorial quilts then and the different methods I’ve come up with to pay tribute to peoples’ loved ones. So, let’s not get too emotional today! 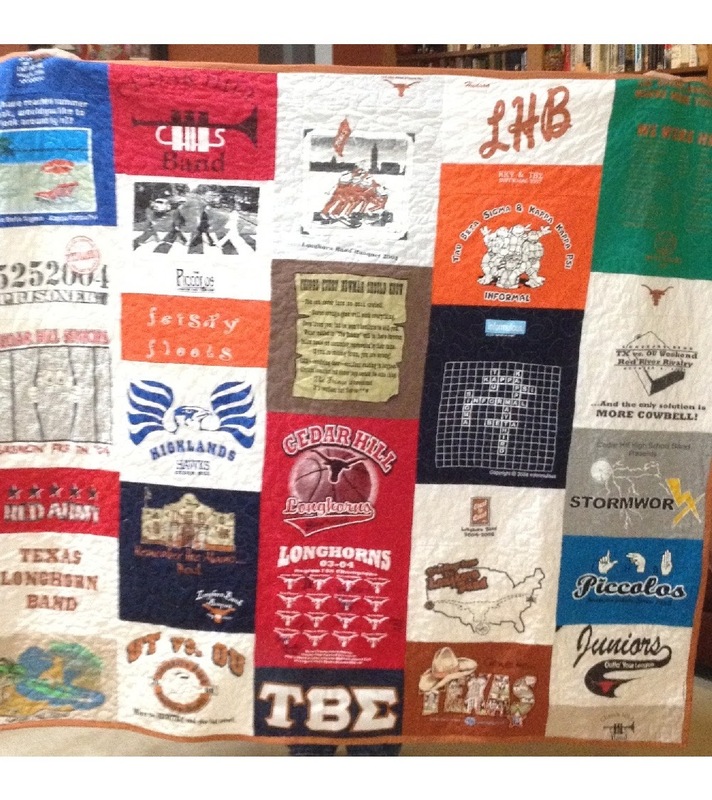 Instead I want to show you a really fun Tshirt quilt I just finished for an alumnus of the UT Marching band! This one wound up pretty big. This happens every now and then and is driven by the materials I’m given and how the requester wants their shirts organized. In this case, there were a lot of shirts with small logos across the front right and a large image on the back. I was asked to group these together, which was no problem. But in order to get all the shirts in, the blanket had to grow! There are so many ways to make Thsirts into quilts and, no doubt, all of you have read of many. For me, I try to just keep things simple and give the requester what they want. I use fusible pellon 880 for my Tshirt backing and generally always use Hobbs Heirloom 100% cotton batting for all of my quilted projects. Fewer shirts allow for more sashing and embellishments, borders, etc. 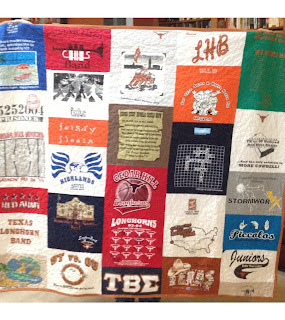 For this one I had barely enough room for the binding, but I made it burnt orange, Longhorn fans! I will be delivering this to a very happy lady in South Austin tomorrow afternoon. I can’t wait to see her face!!! In the meantime I am left with the only advice a girl ever needs.